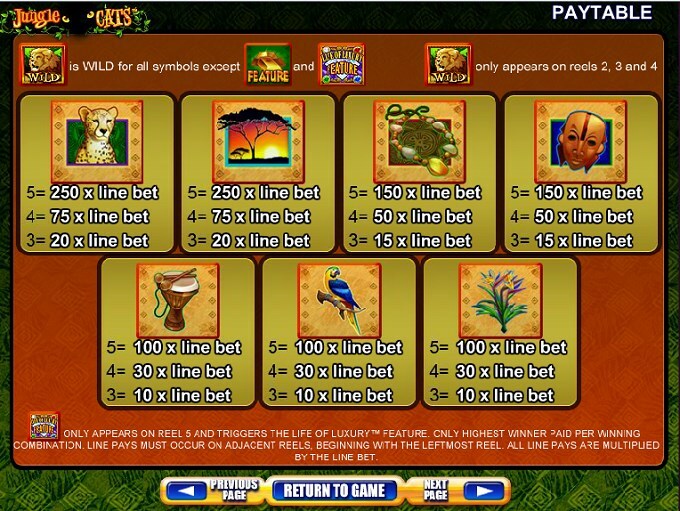 The offer that Jungle Cats has for you is that of a slot machine which is themed around the various felines that live in the jungle. From the lion, to the lioness, to leopards and panthers, the game gives you quite a few of these predators, but there could’ve been even more. The slot’s focus on the jungle cats is by no means exhaustive, and two of the missing ones would be the tiger and the jaguar. The designer that gives us this slot machine is called WMS. You are presented with a set of 5 reels, on which a total of 30 bet lines exist. You can wager on them and the spins will bring you two scatter symbols, wilds, free spins and a bonus game with progressive jackpots as prizes. The regular prizes are much more disappointing, going up to $120 only. 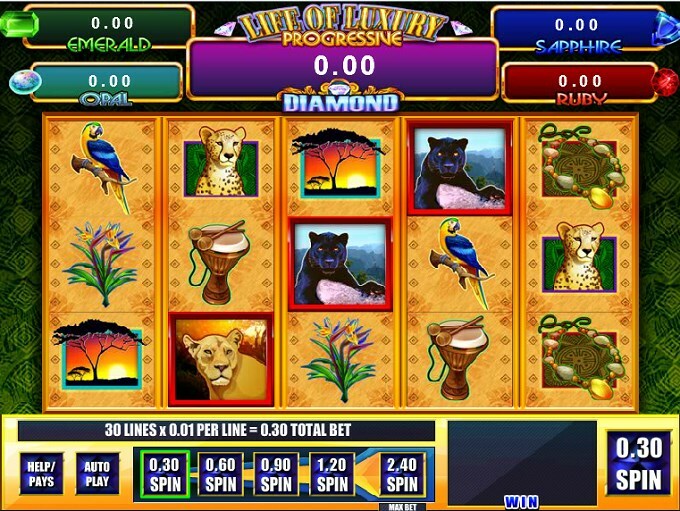 While playing this game, you can expect to find wild symbols on its reels, along with some scatters that can bring you bonus games or free spins. We have the Male Lion in the main role, at least if we consider the wild to be the slot’s most important feature. That might not be the case in this game, since only three reels can get the wild (2, 3 and 4) and it’s not capable of awarding prizes directly. It can only be a substitute for other symbols, though not for the scatters. One of the slot’s special features, Life of Luxury needs its own scatter symbol with its Logo to appear on the 5th reel, in any position. 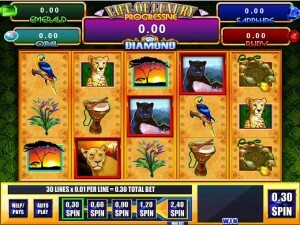 You can win a progressive jackpot in this feature, the amounts for each one being visible at the top of the screen at all times. You get 10 free spins on a new set of reels, and for each appearing gem you get a pick, which gives you a regular prize or a progressive jackpot. With the maximum bet selected, you are guaranteed a win from one of the progressives. The names of the five progressive prizes are Diamond, Emerald, Opal, Sapphire and Ruby. The other scatter symbol has a few gold bars on it and it is responsible for starting out the free spins. Get at least three Gold Bars icons scattered, and the reward will consist in 8 free spins, which can be retriggered as you play. This scatter will award prizes as well, worth 25x the bet when four symbols are present, and 50x the bet when all five are in place. You can get away with very small bets in this slot. At the bottom, you will find the five options, starting from $0.30 ($0.01 per line), then going to $0.60, $0.90, $1.20 and finally to $2.40 (the maximum total bet, with $0.08 being the line bet). 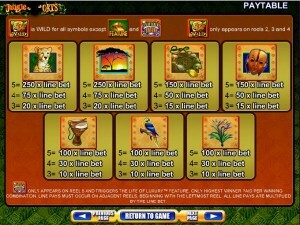 You have the progressive jackpots to look out for, if you get the Life of Luxury bonus game to start. If that doesn’t happen, the slot gives up to 1,500x the line wager as a reward, though in this game that only amounts to $120 cash. The design of Jungle Cats doesn’t have that much to do with the felines, unless you count the symbols which show them to us. Instead, you get more of a tribal feel from the slot, with the green decorations from the background image and the ones from the leather like reels being in the same style. Add some drums which are part of the game, some amulets and an African mask, and you get the picture quickly enough, even without any natives being present. 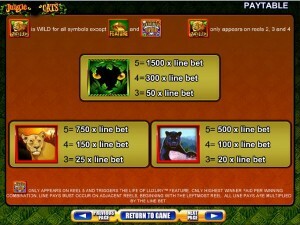 Symbols: Male Lion (wild), Gold Bars (Scatter, 50x total bet), Life of Luxury (bonus), Jungle Eyes (1,500 coins), Lioness (750 coins), Panther (500 coins), Leopard (250 coins), African Sunset (250 coins), Amulet (150 coins), Tribal Mask (150 coins), Tribal Drum (100 coins), Parrot (100 coins) and Flower (100 coins). The game offers plenty, and if you’re just interested in a cheap game to play, with a chance at a progressive jackpot, then it will be a good choice. High rollers can’t do much with it though, it’s just not that kind of game. 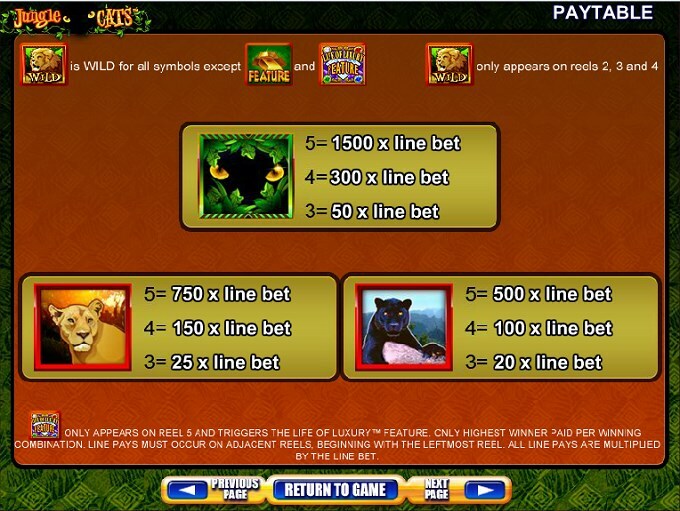 The Jungle Cats slot machine is offered through the WMS platform, so if you want to play it for real or just to practice, look out for casinos that use it.